Established in 1907 by a handful of Polish Immigrants calling themselves “The Sons of Poland”, the Organization became one of the largest community oriented groups of Polish Canadians in Canada. The first branch was formed in Toronto and eventually 47 active branches were located in Ontario as far south as Windsor and as far north as Fort Frances and Red Lake. Optimism prevailed in the fundamental truth that together, things could be accomplished and that unity provides security. 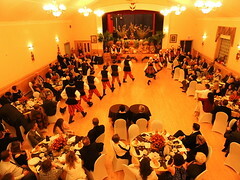 The motto of the Polish Alliance of Canada is “Brotherhood – Tolerance – Education”. Under the link above you will find more about our Organization’s history. Over the years, our fundraising efforts have included dances, garage sales, and the sale of Polish food at the Tecumseh Corn Festival. Branch 20 is a generous supporter of Polish Youth organizations in Windsor such as the Polish School and Tatry Song and Dance Ensemble. We are also committed in supporting Canadian charitable organizations and Windsor hospitals. In the mid 1980’s, we sponsored a soccer team through Polonia Soccer Club and continue to provide an annual donation. Our members volunteer to raise funds for charitable causes and promote our Cultural heritage but we also spend time socializing. We’ve participated in the Canada Day Parade and have held activities such as bowling tournaments and picnics at the Polish Beach. Members have enjoyed one day outings to Toronto, Niagara Falls, Stratford, Grimsby, Frankenmuth, Sea World in Ohio and skiing on Michigan slopes. Since 2005, a busload of members have traveled to Chicago, Washington, Montreal, Boston and New York for a 4 day holiday over the Labour Day Weekend. While today’s membership is not as large as it once was, Branch 20 remains a very visible and effective organization within Windsor’s Polish Community. Meetings are held in January, March, May, September and November at 2:00 p.m. at 1275 Langlois Ave. at Dom Polski Hall. On Sunday, September 23, 2018, ZPwK Grupa 20 Windsor celebrated the 75th Anniversary of our Organization. Celebrations began with a mass of Thanksgiving at Holy Trinity Church attended by guests from Zarzad Glowny, Grupa 20 members, Polonia Organization representatives and parishioners. 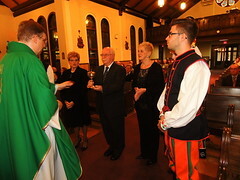 The mass began with the entry of Poczet Sztandarowy. Father Zbigniew Sawicki warmly welcomed everyone in attendance and during his homily praised Zarzad and members of Grupa 20 for our contribution to Polonia and pointing out that it is now the largest Organization in Polonia. 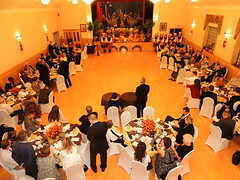 Immediately following Mass, guests ventured towards Dom Polski Hall for a banquet. The hall was elegantly decorated in traditional red & white colours with beautiful table centrepieces featuring a Polish and Canadian Flag. Prezes Zdzislaw Roznawski welcomed the assembled guests. He called for the entry of Poczet Sztandarowy, followed by the singing of the National Anthems and a moment of silence for the deceased members of Grupa 20. He then introduced the Master of Ceremonies – Organizatorka Halina Roznawski who continued the program in English. 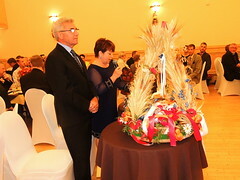 Halina Roznawska greeted the participants and introduced the honoured guests which included: Pan Andrzej Kiela, Vice President of Zarzad Glowny, accompanied by his wife; Pan Jan Adams, Glowny Organizator Zarzadu Glownego, accompanied by his wife; Pan Witold Jaroszewski, Chairman of the Scholarship Committee of the Wladyslaw Reymont Foundation, accompanied by his wife; Ks. Zbigniew Sawicki, Pastor of Holy Trinity Church; Siostra Anna Maria Fidor – Provincial Superior of the Polish Ursuline Sisters and Ks. Kanonik Mieczyslaw Kaminski of Holy Trinity Church. Representatives of 17 Polish Organizations in Windsor and Detroit were also introduced and thanked for their continued support and co-operation. Following dinner, Pan Andrzej Kiela, Vice President of Zarzad Glowny and Pan Jan Adams, Glowny Organizator Zarzadu Glownego, presented glass “trophies” to Past Presidents Zbigniew Kruba, Andrzej Oczachowski and current President Zdzislaw Roznawski, thanking them for their dedication, work and adherance to the motto of Zwiazek Polakow w Kanadzie. Mr. Kiela and Mr. Adams also presented pins and certificates of distinction to 17 of the 20 members with more than 25 years of membership, congratulating them for their years of service. Pan Tadeusz Stanczak is the longest serving member (58 years) and held positions in Zarzad over the years. Due to his health, he was unable to attend the celebration. Prezes Zdzislaw Roznawski is the next longest serving member (43 years), followed by Halina Roznawski (42 years) and Edward Chemel (40 years). Pan Andrzej Kiela warmly spoke about the Organization, congratulating Zarzad and members of Grupa 20 and wishing them continued success and good health. 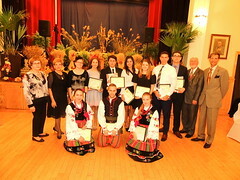 Grupa 20 members, were each awarded an $800 scholarship presented by Pan Witold Jaroszewski, Chairman of the Scholarship Committee of the Wladyslaw Reymont Foundation. Grupa 20 Windsor belongs to the Windsor-Chatham Branch of the Canadian Polish Congress. Pani Beata Slusarczyk, 2nd Vice President of the branch, presented Prezes Zdzislaw Roznawski with a certificate of recognition. Grupa 20 is a regular supporter of local youth organizations and was proud to make 4 donations as part of the 75th Anniversary celebrations. The Polish Language School was awarded $500; Song & Dance Ensemble Tatry were awarded $500, Polonia Windsor White Eagles Sports & Recreation were awarded $250 and Vocal Group “Polskie Nadzieje” were awarded $250. 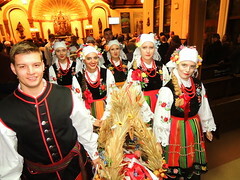 Song & Dance Ensemble Tatry showed their beauty and talent by performing the Kujawiak and the Goralski. Vocal Group “Polskie Nadzieje”, consisting of siblings Julia, Michal & Marysia Zalewski performed 3 beautiful Polish National songs. A 12-minute video showcasing the history of the Polish Alliance of Canada and the activities of Grupa 20 in the previous 25 years were enjoyed by all. As the programme came to an end, Prezes Zdzislaw Roznawski thanked the members of the Organizing Committee for their work towards the success of the event and all the guests for their support of our Organization and participation in the event. He then gave the order for the removal of the Sztandary, thus bringing the celebration to a close. 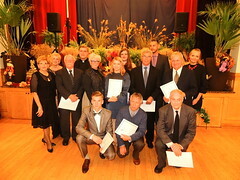 The members of Organizing Committee were: Edward Chemel, Ewa Slominska-Durka, Robert Karpinski, Maria Kulesza, Zbigniew Kruba, Teresa Lewicki, Wladyslaw Roznawski, Krystyna Szczech and Halina and Zdzislaw Roznawski. A celebration such as the 75th Anniversary warranted the publication of a Commemorative Book. Steven Kulesza was responsible for page design and layout and Marta Soszynska designed the beautiful graphics on the cover. 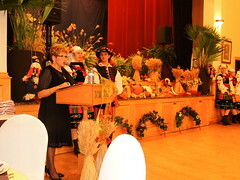 ZPwK 2nd Vice President, Maria Kulesza was solely responsible for collecting the greetings and advertising in the book. The 72-page book will be treasured by members and future members for many years to come and highlights the history of Grupa 20, specifically, the period between 1993 and 2018. 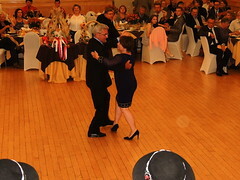 This is the period that included the commissioning of a “sztandar”; Fundraisers such as dances, garage sales, food booths at festivals; $7500 in assistance to flood victims in Poland, $14,000 in support of orphanages in Poland; donations to local hospitals, a $5000 donation to Hospice of Windsor & Essex County; social outings such as the annual members picnic and bus trips. As they departed, every guest at the banquet received a copy of the 75th Anniversary Commemorative Book. Zwiazek Polakow w Kanadzie is guided by the principles of education, tolerance and brotherhood. Grupa 20 has abided by this motto and are proud of the accomplishments in our 75-year history. The celebration held on September 23, 2018 has now become part of our rich history.